The Cumberland Club is a private Federal styled club in the heart of downtown Portland. 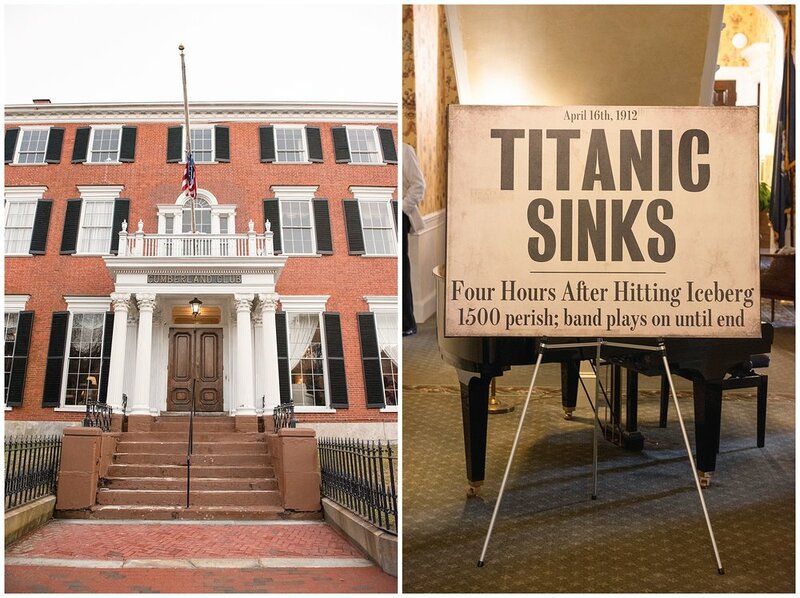 For the night of the Titanic themed dinner, they opened their doors to the public for an evening of period dress, fantastic food, and friendly conversation. 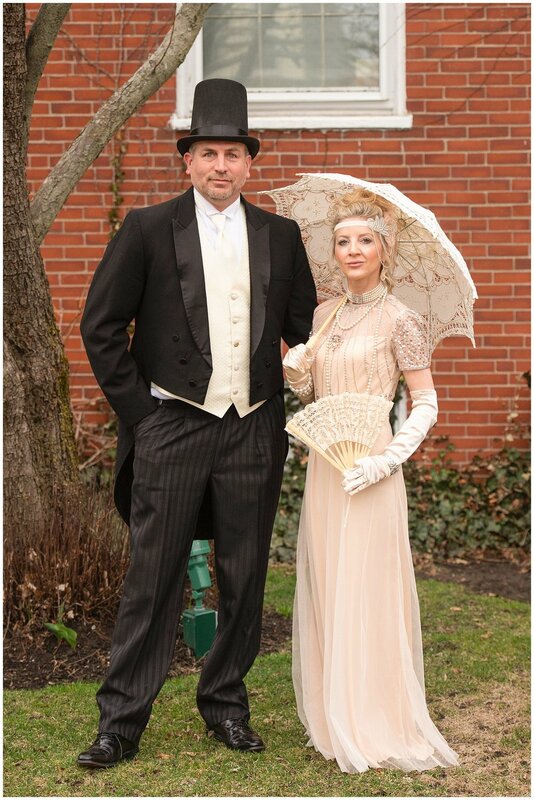 In conjunction with the Cumberland Club, the evening was hosted by The Portland Supper Club. The Portland Supper Club hosts many Chef Curated events throughout the year that are open to the public with ticket purchase and include an amazing communal meal at many of Portlands fabulous restaurants. In the past themed events were hosted at Crooners and Cocktails, Zen Chinese Bistro, and Rhum. To book your Event, Headshots and Business Portraits please click here to contact Brittany & Dean to schedule your date! We will have rain dates in place for our on-location dates in case of inclement weather. **There’s a discount code for 1 free month at Tailwind at the bottom of this blog! While we handle all the imagery, both stills and video, for your website, branding and social media, the one thing we don’t do is Social Media Management. We are really good at visuals, not so much with the words and scheduling. We’ve found the perfect tool for scheduling all your social media on instagram and pinterest! Did you know that there are 250 million users a month on Pinterest and 1 billion on Instagram. That’s a LOT of potential customers out there to get your images and message in front of! Let me tell you a bit about Tailwind - it’s an all in one platform from your desktop to schedule all your pins (you should be pinning 10-12 pins a day!) and all your instagram images (the most successful pinners do up to 3 pins a day). That’s a lot to do on your own - that’s where Tailwind comes into play! With Tailwind I manage all my accounts and spend one morning a week scheduling all my social media materials for the next week - I’m sure if I had more time, I could do a full month in advance! In fact, the images from this blog post have been fed to instagram and pinterest via Tailwind - so simple! I’ll start by walking you through what I do! Every Friday morning is my “Tailwind Day”. Step 1) Get some coffee! Step 3) Assuming you already have the Tailwind extension installed on your browser (if you don’t do that now! it makes the easy job of entering info, even easier!) Now, on my blog site, I click and open each blog, wait until it’s fully loaded, then click the Tailwind extension button and it will pull up a window with all the images in my blog post. From there I can click which ones I want to Pin (or instagram, but I instagram a different way I’ll put below!) Once I’ve clicked the images I want to pin, all I have to do is select an overall board, or different individual boards for each pin, update my description, hit “publish” and tah-dah! All my images from that blog post are scheduled to pin either at a time I select or let Tailwind analytics decide the best times to pin. Instagram. I told you I instagram a different way. Because I use it mostly for my wedding and portrait photography work, I already have all the high resolution images on my computer. Step 4) I create a new folder on my desktop and drag in all the images I want to schedule for Instagram. From there I drop them into JPEGMINI a shrinking app on my desktop. From there I make sure every image is under 5mb after shrinking, if not I drag it into Photoshop and quickly shrink it manually. Tailwind only allows images smaller than 5mb to be uploaded. Step 6) I go through and add a location to each image, caption and hashtags. It’s really convenient through here to copy and paste all the vendor tags from image to image instead of typing them all in time and time again. You can also crop your images in Tailwind which makes it really easy to get everything done right in the computer instead of your phone. Step 7) Once they’re all captioned, tagged, hash tagged, and cropped click on schedule and then they’re all set up and ready to go! To book your Headshots and Business Portraits please click here to contact Brittany & Dean to schedule your date! We will have rain dates in place for our on-location dates in case of inclement weather. I’d love to announce that June is “Update your Headshots” Month. But lets take a minute and rename headshots to “business portraits” please! Most people know them as “headshots” hence the title of the blog - got to that in there for SEO right! But my phone, and, at times, my computer, likes to auto-correct “headshots” to “head shits”. Not too bad unless I’m cruising through some emails quickly and hit send thinking I spelled everything correctly! Super embarrassing. But I digress. Let’s make June the month you update your Business Portraits! We are going to have two weeks of in-studio sessions and two weeks of on-location settings for you to choose from. Our business portrait session are 15-20 minutes in length and you can bring a 2nd change of clothing if you’d like. With your package you receive 3 fully retouched portraits of your choice with the option to purchase additional poses. Your proofs will be up within 48 hours of your session for you to select your favorite 3 for retouching. Each session is $175 per person with a group discount for multiple employee companies. Are your clients Milennials? If they’re not yet, they likely will be in the future and you don’t want to get left in the dust as the markets shift to include them as your primary client. They’re tech savvy, image/video driven, and can see through inauthentic branding. Your brand is so much more than your business! These days clients are not only booking based on product and pricing but also personality. If your business provides any type of service your potential clients are going to want to relate to you on a more personal level. That’s not to say you want to be an over-sharer on the internet - that’s what your personal facebook page is for. But you certainly want to share what makes you - you with your clients. When potential clients connect with you it can lead to higher sales and set you apart from your competitors. For the image below we really worked with the company on who the person is who would use Whiskey Stones. With the images we decided how we wanted to reach those clients. What do they feel when they look at the image? It sounds a bit silly right? But you really need to think of your brand as the main employee in your company. If your company was a person what would their life be like? How would the dress and speak? You want your company to look and feel like “you”. Depending on your business this can mean different things. Now that you’ve thought of your brand as a person, you need to start thinking about your ideal client. What age are they? Married/Single/In a relationship? What’s their occupation? Where do they shop? What is the problem that you’re solving for them? How are they going to shop for that solution - the web, asking friends, printed advertisements - or any combination of those. All these questions can help you identify your ideal client. Milennials are really good at spotting when a company isn’t authentic. So posting the same things on your website, instagram, facebook, twitter, etc can actually cause harm to your brand. As wedding photographers we are guilty of this! There’s so much work that goes into social media these days there’s hardly time to actually BE social! We get that. The best thing is to pick the platforms that really connect with your clients and focus on those. For us that’s instagram for daily photos, facebook for sharing our blog posts, and our website for showing the best of the best images. Oh we also keep up up a YouTube channel with our wedding videos. While your content need to be different on each platform you also need to be consistent in your look and overall message. Good afternoon! Or Morning, depending on when you’re reading this. We wanted to take a minute to introduce ourselves. You may already know us from our main brand - Two Adventurous Souls. We are the same great company we just decided to split off our marketing and branding work from our Weddings and Portraits work to clear up any confusion our business clients had when they landed on our wedding site! We are a goofy duo who love what we do. While we take our job seriously, we have to have fun while we’re doing it! Our main business goal is to help you define yours and showcase it for your clients. TAS Media covers everything from headshots/business portraits through lifestyle portraits and marketing videos for your company. Check out our portfolio - we’d love to work with you!